What is an Easy Setup Key? The Easy Setup Key is a software installer that is plugged into the computer's USB port to install the Linksys Connect software and perform the initial setup of your Linksys Wi-Fi Router or Linksys Smart Wi-Fi Router. This device also has a storage capability that collects network information which can be used if you want to add more computers to your network. IMPORTANT: The Easy Setup Key is NOT a wireless USB adapter. It only works when you have the Linksys Connect software installed. NOTE: If you are using a Linksys Wi-Fi Router or a Linksys Smart Wi-Fi Router, you can create your own Easy Setup Key for your wireless network using a USB flash drive. To learn more about the Easy Setup Key, click here. Should you change any network settings (Network name, passphrase or password), make sure to update the Easy Setup Key. Updating the Easy Setup Key is also an easy way to reconnect your computers back to your Linksys Wi-Fi Router or Smart Wi-Fi Router. 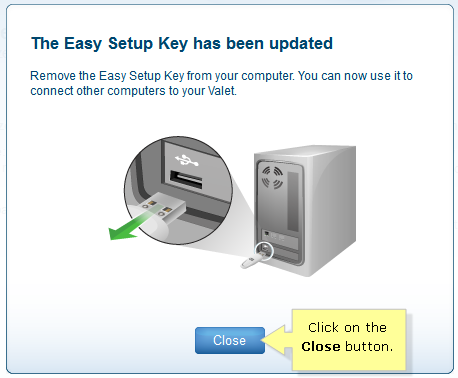 To know more about the Easy Setup Key, click here. Double-click the Linksys Connect icon on your desktop to launch the software and select Router settings. QUICK TIP: If you cannot find the icon on your desktop, you can launch Linksys Connect on a Windows XP/Vista/7 computer by going to Start Menu > All Programs > Linksys Connect. For Windows 8, point your cursor over the upper-right corner of the screen to invoke the Charms bar. Open the Search charm and enter Linksys Connect. To launch Linksys Connect on a Mac computer, open the Go tab and select Linksys Connect in the Applications folder. For detailed instructions, click here. On the Router settings page, click Update or create key. Insert the Easy Setup Key or USB flash drive into your computer’s USB port. Wait while the wireless settings are being copied. NOTE: Make sure your computer can detect the USB flash drive. If not, check whether the USB port of your computer is working properly. You can try plugging a different USB device to this port and check if it will be detected. 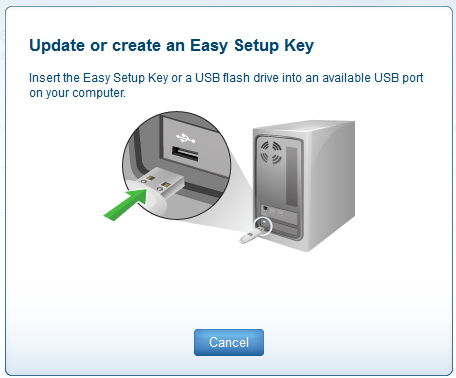 IMPORTANT: If you are trying to create a new Easy Setup Key using a regular USB flash drive, you are advised to format your USB flash drive first. Formatting your USB flash drive will erase all the data you have saved on it. To avoid losing the files, create a backup for your data before formatting. You will then see a window saying that The Easy Setup Key has been updated. Click on Close and remove the Easy Setup Key from your computer and keep it in a safe place. Normally, the network information for your Linksys Wi-Fi Router or Linksys Smart Wi-Fi Router stored in the Easy Setup Key has a 20mb – 30mb file size. If you wish to add a second computer to your wireless network, insert this Easy Setup Key into the computer. To learn how, click here.